We use a Mac Mini from ebay with a 4TB external drive running Plex on top of itunes with a Roku stick in a small Samsung LCD TV. For audio, we hand a TaoTronics Bluetooth 5.0 transmitter off of the digital audio port on the TV and stream to Bluetooth speakers. When near AT&T land we stream over an otrmobile.com $60/month unlimited mifi. When actually cruising OFFSHORE, WHO HAS TIME FOR WATCHING MOVIES? Who is keeping watch? Who is sleeping? Either the watch schedule is badly arrange or you have too many crew members. We only watch them in port or at anchor. I love to watch movies in the evenings when cruising. I watch more movies on the boat than on land. I have a 32" Samsung screen mounted on the forward bulkhead of the saloon of my boat. It draws very little power (15 watts?) and I simply run it off the inverter. In Nordic waters we frequently have fast enough Internet (truly unlimited mobile data in Finland, for example, testing at 30 or 40 mbs, so perfectly adequate for Netflix or any other kind of streaming. I also have multiple terabytes of content on portable hard drives. Some of it can be run directly on the TV via USB stick, but the built-in player (it's an old TV) is not the best and doesn't play all formats, and besides doesn't do subtitles, so I also have a long HDMI cable back to the nav table to connect to the boat computer or a laptop. This works fine, and I'm happy with the built-in sound. I sometimes toy with the idea of upgrading the old screen, but honestly, it looks great, so this maybe a stupid idea. I display nav data on it sometimes on passage, or the radar screen, so that I can keep an eye on things while I'm in the galley or in the saloon. I have a large number of DVD's on board from the old days. I should probably rip them to disk and toss them, but I somehow never get around to it. I'm starting to be dissatisfied with anything less than 1080p content anyway. It's hard to answer the question without knowing the expectations of the OP and the size of the boat. Do you listen/watch expensive screen/speakers at home? I find that a nice pair of over the ear headphones provides higher fidelity than most would want to install and/or pay for on a boat. Headphones would be a big no no if single handing. Small external speakers when more than one person watching the movie can work well. I make do with a 12.5" 1080p laptop and movies stored on the internal 1TB SSD or I have an external 1TB tiny SSD in a tiny USB enclosure. It's slightly bigger than the average flash drive (USB Stick). I don't live on the boat so I just swap movies as needed. I don't care much for less than 1080p content and resist copying movies from other cruisers, as they are usually 720p or sometimes less. Essentially turns the dumb TV into a mini computer with internet access, YouTube, email, Netflix etc,etc,etc. We run a 40 inch led screen, have Logitech surround sound speakers and several tb of music, movies and series running through this device. If you can not use Windows seven, you will have to get an adaptor for windows ten. Why they discontinued the Media Centre facility beats me. Losing it makes Windows ten a step backwards. Watch out for the really cheap TVs that supposedly play back media files from USB. If you want to save power, but crave good sound from a small TV or projector, Bluetooth rechargeable speakers are the answer. And, they are versatile to boot. The problem is that most small TV's don't have bluetooth, but this is easily solved by adding a usb powered audio output to bluetooth adapter to the setup. iPad with lots of memory. It consumes little power L and is easy to charge.. Pick a library of Netflix, iTunes and Amazon movies you can download. 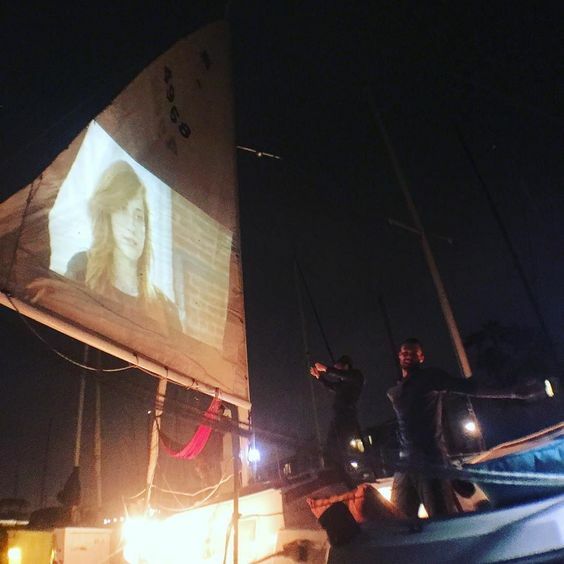 The screen is small but you sit pretty close on a boat and it’s high resolution. Makes everything else I have seen look positively archaic. iPad . The screen is small but you sit pretty close on a boat and it’s high resolution. We have a PI 3 with OSMC. Max power is about 6W, typical about 3W, we leave it running 24/7. Ripped all our DVD/Blu-Ray to portable disks. The PI has built in WiFi, it is our network master as well (the conmann network controls in OSMC are not the best, but we manage to make them work). OSMC includes a DLNA/UPnP server. We can watch on a monitor we have with HDMI from Pi. If your monitor has speakers then that covers sound as well, otherwise Pi analog out to stereo system. With the DLNA server you can also watch the whole library on just about any tablet/phone. If someone gets insomnia, or we have guests with kids they can connect their tablet to the WiFi, put in headphones, and zone just like they weren't on a boat Of course, their selection is limited to what we ripped - they don't always have the same taste in movies. We use a PI 3, have had video playing on the monitor and two people streaming all at the same time, no problems. When we have internet can also use OSMC to do some streaming, but the required bandwidth, along with geo-blocks means it doesn't happen too often. I am curious to learn what kind of answer to this question you are looking for. Collect plenty of movies and TV series from fellow yachties or download from streaming sites like pirate bay etc. Store on SS hard drives. Play them on a laptop and have a cable that charges using a 12V cigarette lighter socket. For speakers a Bluetooth USB speaker from Amazon or EBay for $15 is fine. Wow, we are primitive compared to what I am reading here. We have a Mac book air with a cheap DVD player and a bunch of discs. We stream off of YouTube as well, and use an older Bose Bluetooth speaker for better sound quality. It works well, and the total amp draw is quite minimal.